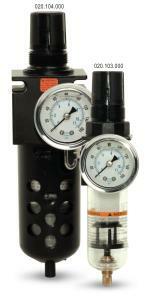 SANDPIPER genuine Filter / Regulators are specifically developed for air operated double diaphragm pumps. They provide clean, dry air to your AODD pump, while offering modular convenience for easy installation and service. Do I Also Need a Lubricator? Our pumps are designed to operate WITHOUT lubrication & this is the preferred mode of operation. In applications with poor quality air supplies or where nitrogen is being utilized to operate the pump, lubrication of the compressed air supply is required. For these situations, we offer a complete line of Lubricators that easily connect to our Filter / Regulators.